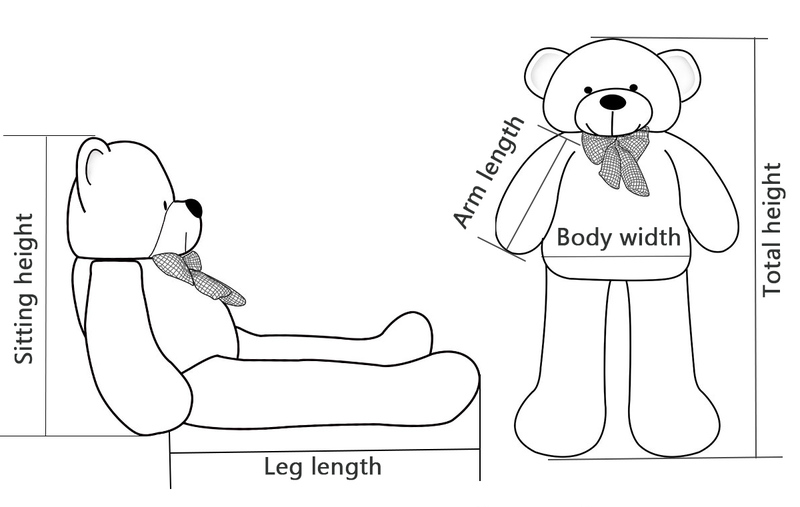 This soft and cuddly giant Teddy Bear is a great gift for your child or loved one. Comes with a divine pink velour exterior and strong polyester cotton stuffing. This giant Teddy Bear is 63 inches tall (more than 5 feet). While large in stature, it is equally impressive in its pillowy softness. This stuffed animal is a wonderful cuddling companion for young and old alike. The plush coat is made of high quality velour, and it is filled with a polyester cotton that makes for a cozy bear friend. All of the material used in Joyfay® products is of high quality, and is completely new. No repurposed materials go into our stuffed animals, and this means you are getting safe and healthy fabric to bring into your home. In fact, the Pennsylvania Bureau of Occupational and Industrial Safety has certified these products as safe. This meant rigorous testing procedures to ensure that this giant Teddy Bear is chemically and physically safe for all. The snuggly behemoth ships quickly from one of our many locations, so you can receive it promptly, with no worries about lengthy shipping delays. This commitment to customer care is further seen in our Love-Me-For-Sure guarantee. We are so sure that you’ll love your new furry friend, we guarantee to be there for you in case of any issues or problems on your end.